FC Halifax manager Neil Aspin has said his side will be clear underdogs for their FA Cup first-round tie against local rivals Bradford City. The non-league Shaymen meet the Bantams of League One on Sunday. Aspin's side are currently sitting fourth in the Conference, while Phil Parkinson's men go into the tie on a five-match winless run. 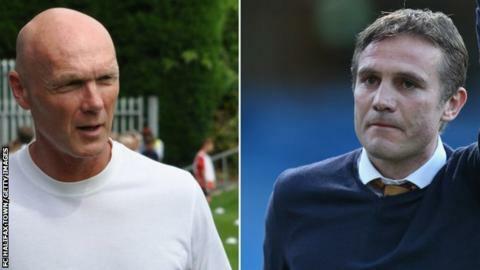 "I'd be silly to read too much into their recent results," Aspin told BBC Radio Leeds. "In terms of finances it's a massive gulf - their top earner earns more than our squad put together. "We are the underdogs. We do have a chance but they have a much bigger chance. "If they play to the best of their ability then it is going to be very tough for us. But when it comes to kick-off we have to got to give it a real go." Meanwhile, Bantams boss Parkinson, who led his side to the League Cup final in 2012-13, hopes his team can use the game to turn their season around. The Valley Parade side were seventh in the table after their last win on 4 October but have now slipped down to 14th place. "I don't see why the game is bigger for them that it is for us," he told BBC Radio Leeds. "It is the FA Cup and there is a lot of local pride at stake. We want to get our season back on track and this is a good opportunity to do that."